Acknowledging this apartheid system is a dangerous thing for American elected officials to do. Just in 2016, when presidential candidate Bernie Sanders dared to say that “We are going to have to treat the Palestinian people with respect and dignity” it became a major media event. Omar and Tlaib endorse Boycott, Divestment and Sanctions (BDS) movement, a Palestinian-led movement to pressure Israel to change course on Palestine. Opponents have dishonestly cast it as inherently antisemitic. The furor over BDS has led more than half of US states to pass laws attacking BDS. These laws clearly trample on the constitutional right to free speech and expression, but that didn’t stop the US Senate from passing the very first piece of legislation this session, which forbids Congress from pre-empting such state laws. So by supporting a justice movement for Palestinians, Omar and Tlaib have opened themselves up to a torrent of attacks from liberals, centrists and the right. The House minority leader, Kevin McCarthy, took these attacks one step further, threatening to punish the two representatives if Democratic party leaders failed to do so. Then the real tsunami began. Omar was immediately labeled an antisemite. 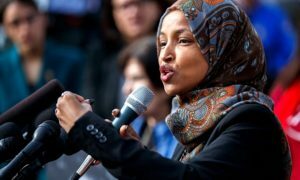 By early afternoon on Monday, Democratic leaders – who sank a proposal to censure the nine-term, openly white supremacist representative Steve King just weeks earlier – had called on Omar to apologize, which she did promptly. Evil people have used the hateful conspiracy theory that Jews use their money to secretly control politicians and the media to commit atrocities against Jewish people for many centuries. Everyone, especially politicians, should know and acknowledge this. But in doing so, it’s incredibly important to be able to distinguish between real antisemitism and basic political facts. We need to be able to examine the money and influence in politics that every special-interest group, including pro-Israel lobbying groups such as Aipac, wields. Often, because of their ability to pay for costly lobbyists and fund political campaigns, these special interests drown out the voices of everyday Americans. As a result, members of Congress are way out of touch with the views of their own constituents. Omar’s controversial tweets noted two important realities. First, money is a huge problem, and motivator, in Washington. Second, Aipac is a powerful group that uses its money to influence the policy decisions of members of Congress. As Mehdi Hasan and Ryan Grim detail in the Intercept, Aipac officials have bragged about their power over Washington lawmakers. I explain at Sludge that Aipac played a role in forming separate pro-Israel Pacs and has encouraged its members to donate to its favorite candidates for decades; it spends more money than any other pro-Israel group every year to lobby the federal government; it holds annual conventions featuring sympathetic members of Congress; and it’s spent nearly $16m since 2000 to send groups of congresspeople to Israel to learn about the two countries’ relationship through the Aipac lens. Antisemitic incidents have risen drastically in the US since Donald Trump took office. Neo-Nazis rallied in Charlottesville in 2017. Eleven Jews were murdered in the Tree of Life synagogue last October. Two weeks ago, neo-Nazis burned and painted swastikas on yeshiva buildings in my state of New York. Discussing the political influence of Jews and pro-Israel groups, including some that have considerable evangelical Christian support, should surely be done delicately, but we can’t pretend an insensitive tweet about politics is in the same universe as support for white supremacy, as McCarthy preposterously asserted. We need to be honest about what is truly antisemitic and what are inconvenient facts of Washington. I was raised Jewish, so while everyone should be deeply concerned about antisemitism, I know the issue affects me personally. If there’s anything I’ve learned about Judaism, it’s that standing up against hate and oppression is about the best thing I can do to honor Jewish history. That’s why I, along with many American Jews, support BDS and unapologetically condemn the current government of Israel for its heinous treatment of Palestinians. J Street, a moderate pro-Israel group that has a Pac that spends a lot of money on politics, is right: we must recognize antisemitic tropes, but “elected officials should also refrain from labeling all criticism of Israeli actions or policies as ‘antisemitic,’ in a transparent effort to silence legitimate discussion and debate”. Labeling anyone who speaks of Jews and money in the same sentence an antisemite weakens our fight against the real antisemitic, neo-Nazi, and other white nationalist forces that have seen a resurgence in recent years. It also stifles legitimate discussions about the enormous power of special interests, something that threatens our democratic political system. We must speak honestly about the issues Ilhan Omar has raised. In an era of unprecedented corruption in Washington, we can’t afford not to.